So, as you may have noticed from the previous posts, I’m not a big thriller reader. Detective or mystery stories, yes, lots of them and preferably set in any period not now (I’m not a CSI girl). I have read some John le Carré before – because before watching the film of Tinker, Tailor, Soldier, Spy, I wanted to have read the book – to see if it was going to be too violent for me to cope with (for my post about the contradictions of my job and my aversion to violence in films see this post on my other blog). I enjoyed it so much that I not only watched the film and most of the Alec Guiness TV adaptation, but also read The Spy Who Came in from the Cold – which is also really good. I’ve been keeping my eyes out for more of his Smiley series at the library – but hadn’t read any of his newer books* – hence my entry into the Goodreads giveaway (despite the enormous size of the to-read pile) and I was really pleased when I won a copy. I’m always very careful not to give away plot spoilers in my synopsis, and it’s quite hard with A Delicate Truth to say much about the plot without saying too much, so I’ve taken my cue for this from the Goodreads synopsis. The story centres around a top, top secret counter-terror operation in Gibraltar – what happened, how it was set up and whether it was the success that it was meant to have been. The intertwining plots are carefully and meticulously constructed – I never thought that I knew what was coming next and at the end I still had questions (in a good way) and wanted to know more. The characters are believable – in some cases horribly so – and you really can imagine that these events could possibly have happened – although you hope fervently that they haven’t. Le Carré still has the knack for describing the workings of government in a way that feels real, and in addition, in this book he turns his focus on the world of private defence contractors. I’ve read a lot of news articles about this new aspect of the military world and I can’t claim to know first hand what any of them are really like, but it’s clear that the author isn’t keen, shall we say, on this latest development. And if anything near of the shenanigans that go on in this book have gone on in real life (and I devoutly hope they haven’t) then he’s got reason. This is an exciting and page-turning book – which I gobbled up in a day’s commute and an evening’s reading. I would recommend it to anyone who has read his earlier works or people who like a thriller at the cinema and want a book for their summer holiday. I’m not surprised this has done so well – I’ll certainly be passing it on to the thriller readers in my family (my dad and The Boy). 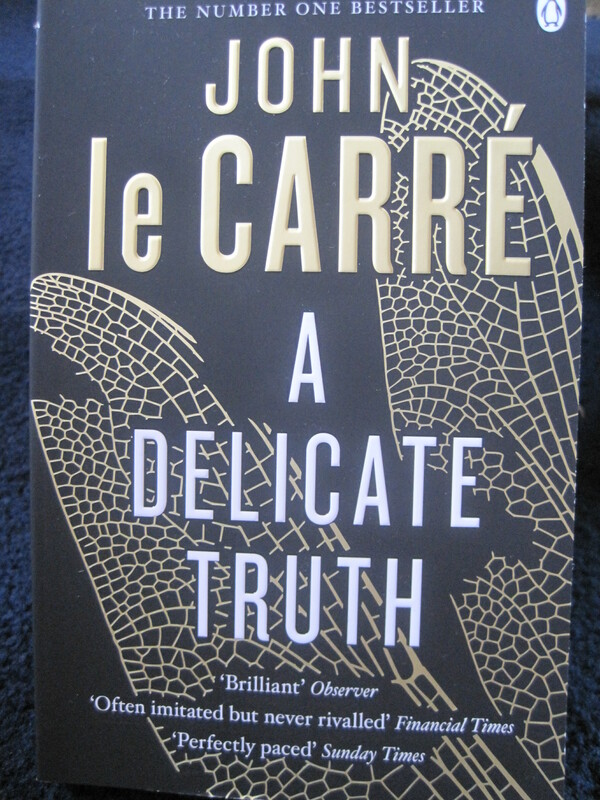 A Delicate Truth by John le Carré can be found on Kindle or as a proper book all over the place (although my link is Foyles, for reasons previously explained) and you can also see more reviews on Goodreads. * I nearly put “contemporary books” but then I remembered that the Smiley books were written at the time that they were set in, it’s just me that’s reading them now! Does anyone know the meaning of “delicate” as it is used in the title? I really enjoyed this book but was left a little baffled. I saw it as the equivalent of when its used in “delicate negotiations” – something sensitive that needs to be handled carefully. May be wrong though!